Underware licenses Unibody 8 for the person who downloaded the Unibody™ 8 Font Software from Underware’s website [www.underware.nl]. It is not allowed to transfer this license agreement to any third party. You are granted a non-exclusive right to use the Font Software to produce and display typefaces on a screen, a printer, typesetter, film recorder or other output device. You agree not to modify, adapt, translate, reverse engineer, decompile, disassemble, alter, redigitize, convert or otherwise attempt to discover the source code of the Font Software. You shall not transfer the License Agreement issued to you, to a third party, neither partially, nor completely. This License Agreement is non-transferable, unless you have written permission from Underware. Embedding of this particular Underware Font Software [Unibody™ 8] is allowed. If embedding of the Font Software is desired (e.g. on the internet or cd-rom), an additional license is not required. You’re allowed to embed the Font Software in a published document. Underware reserves all rights not expressly granted to you under this License Agreement. You may take a digitized copy of the Font Software used for a particular document to a commercial printer or service bureau for use by the printer or service bureau in printing such document. You can include the Font Software in a document for the printer or service bureau, but you may not distribute the document with the Font Software to any other third parties, including but not limited to the internet and cd-rom. You are also not allowed to redistribute the Font Software. You agree that the Font Software and Documentation, and all copies thereof, are owned by Underware, and such structure, organization, and code are valuable property of Underware. You acknowledge that the Font Software and the documentation is protected by the laws of the Netherlands, by the copyright and design laws of other nations and by other treaties. You agree to treat the Font Software as you would any other copyrighted material, such as a book. You agree to use trademarks of Unibody™ according to accepted trademark practice, including identification of the trademark owner’s name. Trademarks can only be used to identify printed output by the Font Software. The use of any trademark as herein authorized does not give you any rights on or to intellectual property rights in the Font Software, the documentation, and any associated trademarks. Underware retains title and ownership of the Font Software, the media on which it is recorded, and all subsequent copies of the Font Software, regardless of the form or media in or on which the original and other copies may exist. PostScript® are registered trademarks of Adobe Systems Incorporated. Macintosh® is a registered trademark of Apple Computer, Inc. OpenType® is either a registered trademark or a trademark of Microsoft Corporation in the United States and/or other countries. Windows® is a registered trademark of Microsoft Corporation. All other trademarks are the property of their respective owners. Since Underware doesn’t charge a fee to use this Font Software, Underware does not and cannot warrant the performance or results you may obtain by using the Font Software. The foregoing states the sole and exclusive remedies for Underware’s breach or warranty. Except for the foregoing limited warranty, Underware makes no warranties express or implied, as to non-infringement of third party rights, merchantability, or fitness for any particular purpose. In no event will Underware be liable to you for any consequential, incidental or special damages, including any lost profits, business interruption, loss of business information, lost data or lost savings. Even if an Underware representative has been advised of the possibility of such damages, or for any claim against you by any third party. You agree to indemnify and hold Underware harmless from and against any claims or damage which may result from your breach of this License Agreement. The license is effective until terminated. Underware has the right to terminate your license immediately if you fail to comply with any terms of this Agreement. In addition, Underware reserves the right to claim punitive damages. Upon such termination you will destroy the original and any copies of the Font Software and related documentation and cease all use of the Trademarks. This agreement will be governed by the laws in force in the Netherlands. You acknowledge that you have read this Agreement, understand it and that it is the complete and exclusive statement of your Agreement with Underware which supersedes any prior Agreement, oral or written, and any other communications between Underware and you relating to the subject matter of this Agreement, and that your obligations under this Agreement, shall inure to the benefit of the Underware licensors whose rights are licensed under this Agreement. 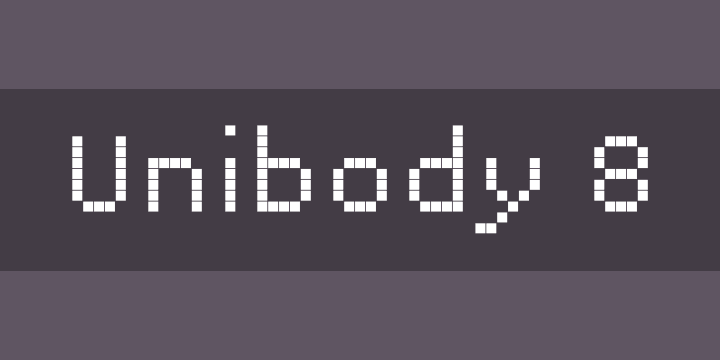 Unibody, a cross-platform OpenType-font for Flash MX.